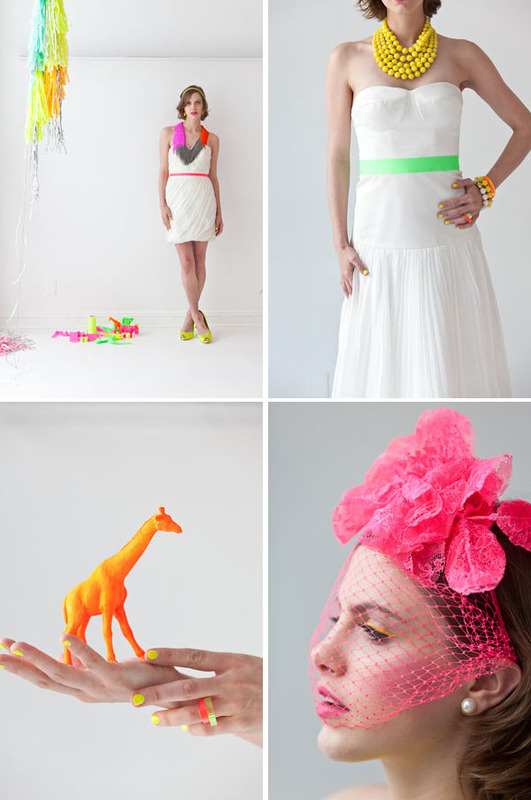 Last December I had the pleasure of visiting Jennifer Behr‘s studio in Williamsburg, and absolutely fell in love with her line of neon veils…right then and there I was determined to show how a modern bride could use them for her own wedding. Neon is a wonderful accent to stark white and makes for a great pop against a neutral base. I teamed up with photographer Jenny Ebert of 1. art beauty life and Jackie Weppner of Merci New York to help style the shoot (since I’m a photoshoot newbie 🙂 In this post we’ll focus on how to work neon into your wardrobe, and later this afternoon, how to work it into your decor. Enjoy! Above: 1 dress, 2 looks….changing the necklace makes a huge difference right? It’s all about your comfort level…you can go with a subtle pop or go full on color blast! 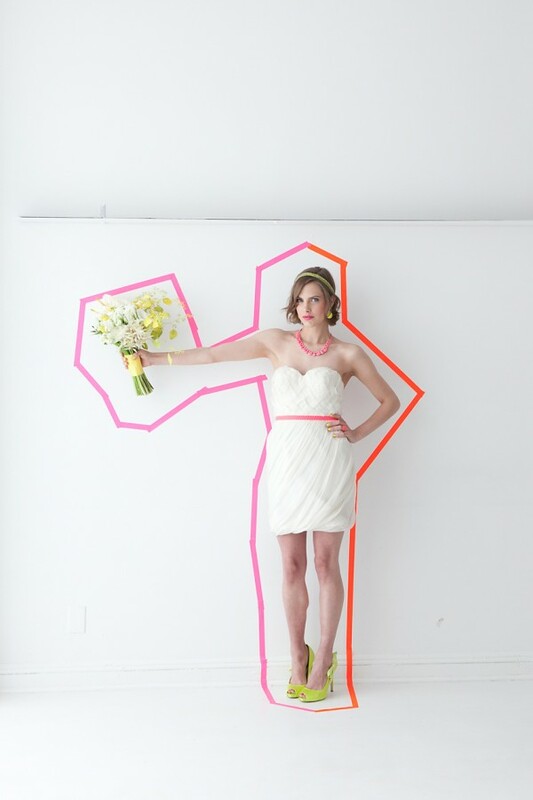 Cheap trick tip: Adding pops of neon doesn’t have to be expensive! Sometimes all it takes is a spray can, fabric dye, paint or even nailpolish. Those earrings you see above? I bought them from a street vendor and painted them with some fluorescent yellow nail polish! You can do the same thing with necklaces or other pieces of jewelry too..
Cheap trick: You can buy simple trim from a fabric or ribbon store to add a bit of color to your dress….for this shoot, fluorescent ribbon was used as dress sashes and bracelets! 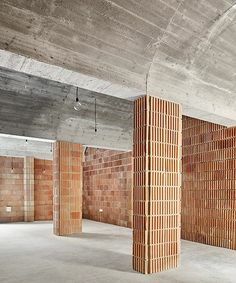 Dont want to commit to a lot of color all at once? A pop of pink lipstick, a bright chunky necklace, or even some colorful bobby pins could give your outfit just the punch it needs. 1. art beauty life, Merci New York, and Blossom & Branch are vendors of Brooklyn Bride’s preferred vendor listings. Love this, SO fresh! My bridal shower was white & grey with pops of neon. I am totally on board with this. I love these colours, bright, bold, and super gorgeous! Neon colours make me happy! Come on! Come on! Good news! Our Cheap UGG Boots is open now! All the uggs clearance now! On our website, there are all kinds of ugg boots which can satisfy people of all ages. Yes! You did not see the wrong thing. Pingback: neon inspiration | hello, hello shiso!